Do you want to try rafting in Indonesia? Just try rafting at Serayu River. 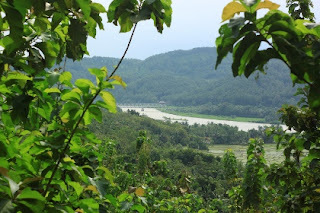 Serayu River is one of the natural attractions found in Central Java Province. Rivers that disgorge the Dieng plateau and has a length of about 30 km of this, across the five districts, including Wonosobo, Purbalingga, Banjarnegara, Banyumas and Cilacap. River which empties into the Indian Ocean is, having a width of about 12-25 m.
Besides being a source of life for the community, Serayu River is also a sport where rafting. Because, in this river is crossed by pengarungan field is unique and challenging. With the river conditions are like that, then local government is committed to genuinely develop this river into the resorts and at the same location rafting sport. The effort has turned out to fruition. 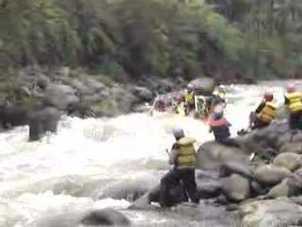 Proven in 1997, River Serayu never be used as a sports race rafting national level. Starting from the existence of this river that was then becoming increasingly popular. According to local story, in former times Serayu River is a water transportation route traders from China, India, and Arabic. The merchants that sailed this river upstream to peddle wares. This can be evidenced by the finding of a variety of relics that can still be seen up to now, among them the discovery of the former dock building, Chinese ceramics, metals and foreign currency. Objects there are relics in the village of Plana, Banyumas. Serayu River has beautiful natural scenery, unique cliffs that juts into the middle of the river as well as various types of rocks that stand out. In the vicinity of this river, visitors can also see the expanse of paddy fields and verdant gardens population. Visitors can also take advantage of his visit while fishing. Many of the fish contained in this river ranging from tilapia, catfish, shrimp, and so forth. For you fans of white water rafting, river Serayu is appropriately used as a test of your adrenalin. Many sports fans visiting the river rafting this. Rafting on the river has two trip pengarungan each is about 12 km with a travel time of approximately 2.5 to 5 hours of travel. During berarung rapids, visitors will be able to enjoy the beauty of natural scenery along the rivers. This river is also famous for its annual tradition called Grebeg Suro. Suro Grebeg tradition held on the banks of the River Serayu usually equipped with a mound containing agricultural products, such as peppers, eggplant, long beans, etc. as well as the fruits of them barked, bananas, apples, and so forth. To obtain a wide range of agricultural products, visitors can participate scramble after the completion of this tradition. Serayu River there is also another event that is not less interesting, namely Serayu Festival. Serayu Festival event is the celebration of entertainment consisting of various races including rowing boat race, stage games, kite show ornamental, and other race-race. Boat race is usually a distance of approximately 1 km, with a capacity of one boat consists of 9 rowers as a group member. To enliven the festival, also held a variety of performing arts such as stage all-night wayang kulit, kuda lumping stage, karaoke, and others. The festival is held in order to promote tourism again Banyumas Serayu River water. Serayu River entered into five administrative districts, namely Wonosobo, Purbalingga, Banjarnegara, Banyumas, and Cilacap, Central Java Province, Indonesia. However, for visitors who want to see the tradition of the Festival Serayu Grebeg Suro and may visit the District Rawalo, Banyumas. As for visitors who wish to exercise rafting can go to the Village District Tunggoro Sigaluh, Banjarnegara District.